Quick Post: This is always welcome at any get together – seriously! Everyone always loves this stuff and asks me for the recipe. I found this at least six years ago on Allrecipes.com. I don’t change a thing either – you can’t mess with perfection, after all! It’s not the cheapest appetizer, but thankfully I have over half of these ingredients on hand at any time. Be sure to leave your cream cheese out for a few hours before you make this and roast your garlic ahead of time too so it’s cool enough to handle. I usually serve this with sliced baguette or Tostitos Scoops, it’s also nice to keep this warm in a small crock pot so it stays nice and melty. Thanks for reading, enjoy! 2. Place garlic in a small baking dish. Bake in the preheated oven 20 to 30 minutes, until soft. Remove from heat. When cool enough to touch, squeeze softened garlic from skins. 3. 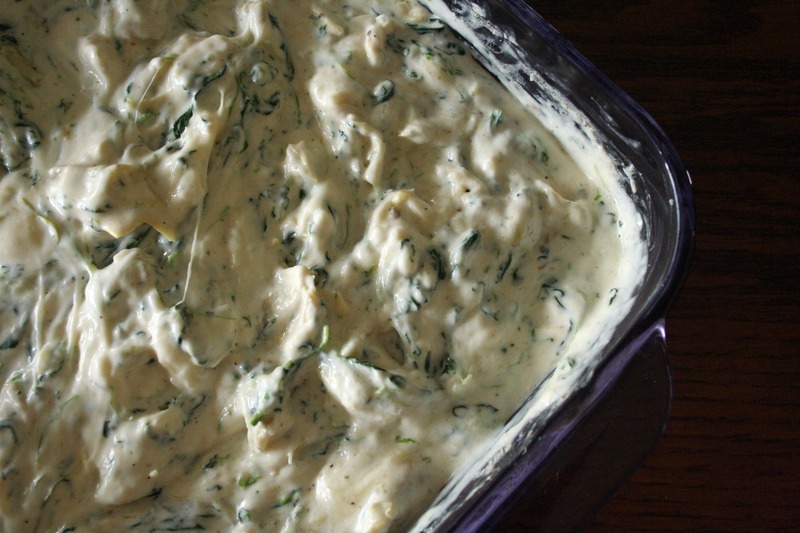 In an 8×8 inch baking dish, spread the roasted garlic, spinach, artichoke hearts, Alfredo-style pasta sauce, mozzarella cheese, Parmesan cheese and cream cheese. 4. Cover and bake in the preheated oven 30 minutes, or until cheeses are melted and bubbly. Serve warm.